Photo Gallery #766: Click edit pencil to get the selected gallery name. 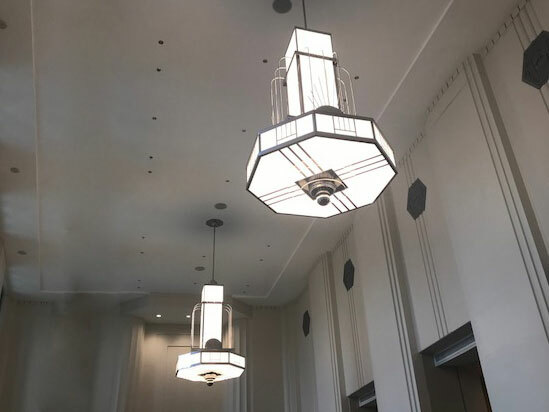 Manning Lighting collaborated with the design team to create new custom art-deco style light fixtures for the lobby of this renovated 1939 performance hall. The pendants measure 62 inches in width and 172 inches in height and feature a chrome powdercoat paint finish. Almost 400 watts of 3000K LED boards evenly light the acrylic panels of the fixture tower and body as well as providing ample ambient illumination.